NO FEDERAL CONTRACTS FOR CORPORATE DESERTERS? Democrats are introducing a new common sense bill that is a step in the right direction for every hard working middle-class American. 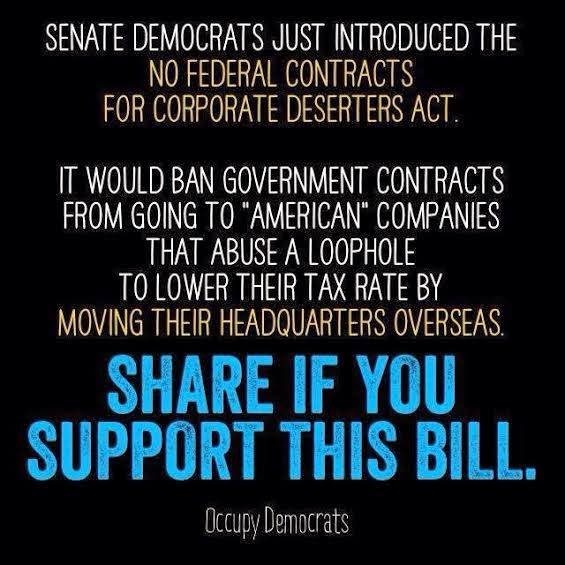 Senate Democrats have introduced "No Federal Contracts for Corporate Deserters Act." As the title suggest, the bill would bar American companies from receiving government contracts if they move overseas, or merge with foreign firms, to avoid paying taxes in the United States. Conversely, President Clinton was running budget surpluses when he left the White House ... and, FYI, President Obama has reduced budget deficits from the $1.4 trillion per year left to him by President Bush in 2009 to the $514 billion that's expected this year by the Congressional Budget Office. For a review of U.S. budget history, click here. 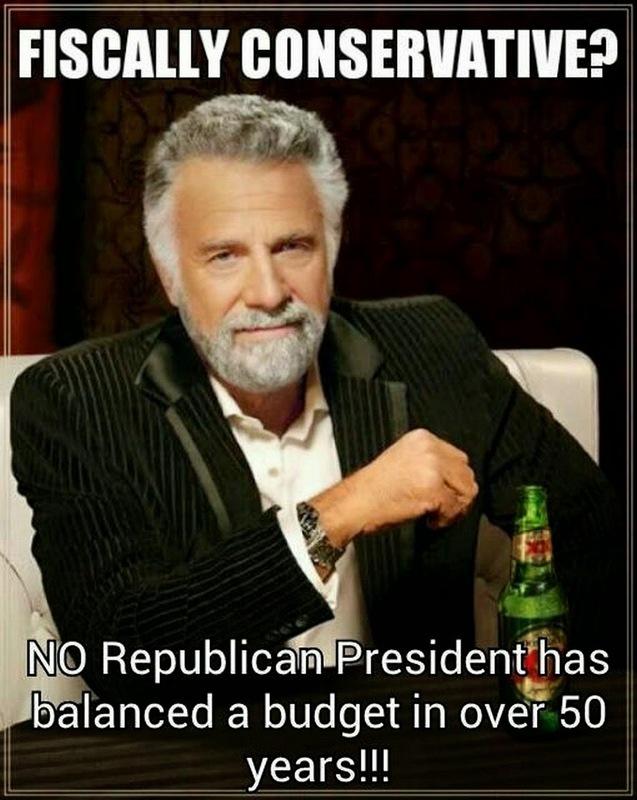 Click here for just one example why the GOP can't balance a budget. One of the cable programs that I enjoy watching is Pawn Stars. The shop's co-owner, Rick, seems like a good guy who knows his stuff. It's also fun watching the experts come in to explain market values on everything from classic cars to classic toys. I especially like watching when people come in with artwork or other artifacts they purchased or inherited. They often believe what they have is worth a small fortune, only to learn from the experts that what they have is worth only a fraction of what they want. Most accept the experts opinion. Others leave grumbling, saying that they will get the price they want (or paid). But we all know, absent the appearance of a miracle or a sucker, they're really just talking to themselves. They won't get the price they want. I bring this up because we are seeing the functional equivalent of Pawn Stars' disappointed and delusional clients played out at the international level. Only this time, instead of Rick, we have Argentina telling grumbling creditor-clients that they need to accept new market prices, which were established in 2005 and 2010 when 90 percent of Argentina's creditor-clients renegotiated what was owed to them. When Argentina experienced a political crisis in 2001 and 2002 banks and other financial institutions who had lent Argentina money in the 1980s and 1990s (and earlier) became worried. Many believed that Argentina could no longer pay what they owed and decided to sell their debt contracts. Many debt contracts were sold in a fire sale for pennies on the dollar, with the sellers effectively telling the buyers, "Good Luck." While 93 percent of Argentina's creditor-clients accepted the result of the negotiations, and new prices, a small group of holdouts who had purchased Argentinian debt contracts (again, for pennies on the dollar) did not. They want to be paid the full value of the debt contracts they purchased, and have dug in their heals. They are also considered "vulture capitalists" because of how they are preying on distressed debt. So, for example, a $100 million Argentinian debt contract might have been discounted and sold for $35 million. But the new buyers want $100 million. If we're thinking about Pawn Stars, it would be as if someone bought or inherited a classic piece of valuable art that suddenly dropped in price. They then enter Rick's pawn shop to demand that Rick pay them what the art piece was once worth. What do you think Rick is going to say? Unfortunately for Argentina things aren't so cut and dry in international financial markets. When Vulture Capitalists purchase and hold contracts that are worth more than what they paid they can use both political pressure and the courts to press their case. It doesn't matter that Argentina negotiated new debt contracts in 2005 and 2010, which established a new "market" price (interest and terms were renegotiated too). With politicians and the courts working for them Vulture Capitalists believe they are entitled to the full value of the contract. While Argentina did not agree to pay 100 cents on the dollar they did agree to pay more than the pennies on the dollar the Vulture Capitalists paid. You would think that this would have been good news for the Vulture Capitalists, right? Not so fast. 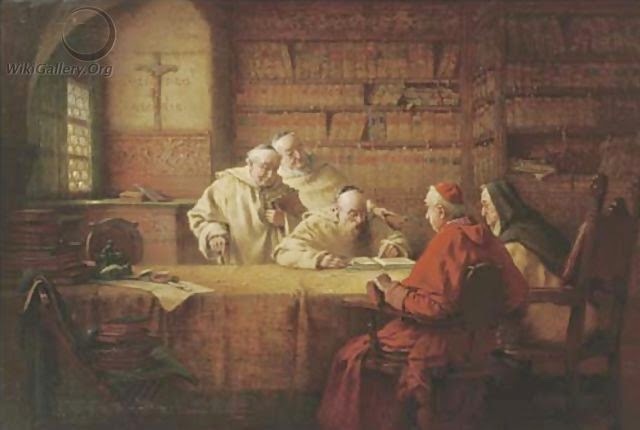 The new creditors want to be paid the full value of the contract. And they're threatening to force Argentina into default this week if they don't get their way. This is where it gets interesting, and why additional history is warranted. After Argentina went through economic turmoil in 2001 and 2002 - a period that was called the worst in its history - Argentina's debt as a percentage of GDP rose to 166 percent. Worse, the political gains made in the 1990s, after decades of military rule, were very much in danger. Argentina's President Fernando de la Rua (now on trial) even had to flee the presidential palace on a helicopter after riots escalated. 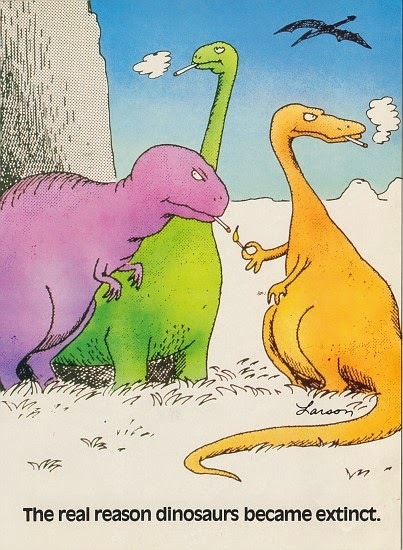 Everyone understood the stakes involved. Over 90 percent of Argentina's creditors - which included U.S.-based unions, pension and retirement funds - agreed to accept the new reduced terms. So, for example, instead of getting a 15 percent interest rate of return creditors might get 10 percent. This was considered better than the alternative, which included non-payment, or outright default. Again, this was an agreement that over 90 percent of Argentina's bondholders accepted. Those who accepted the new terms understood that you cannot drive debtors into a corner (think Wiemar Germany). They wisely understood that an Argentinian political and economic meltdown could do damage that would reverberate throughout the region, and the global economy. Unfortunately, this is not the case with 7% of Argentina's bondholders, who are known as Vulture Capitalists. They don't care that they didn't actually lend Argentina money. They don't care that they purchased the contracts for pennies on the dollar. And they don't care that the only reason Argentina is in a position to pay back their debts today is because other creditors sacrificed and renegotiated. Their only goal is to strip Argentina's economic carcass, regardless of the political and economic consequences it could have down the road. The market players who paid pennies on the dollar - and who work for Vulture Capitalist firms - are demanding that Argentina pay them the full value of their contracts. These firms never lent Argentina money. The firms simply purchased discounted debt contracts, many of which originated when Argentina was run by the a brutal and corrupt military dictatorship. Worse, the Vulture Capitalists want Argentina to pay them before they pay those who agreed to restructure Argentina's debt, and those who are currently lending Argentina money. To get satisfaction the Vulture Funds have taken their case to court in the U.S. Incredibly a New York district judge has sided with the Vulture Capitalists, awarding two firms $1.3 billion. Stating that 'judgments are judgments' U.S. District Judge Thomas Griesa is effectively elevating the rights of those who purchased Argentina's debt for pennies on the dollar over those who worked with Argentina, and helped the country avoid civil unrest. Going back to our Pawn Stars example above, can you imagine the owner of a classic car going to Rick's pawn shop and telling him that if he doesn't get his $100,000 asking price that he'll sue him in court for the money? Can you imagine a court taking the car owners side? Right about now, I'm sure, there's probably a few readers yelling at the screen something about the "sanctity of contracts." All I have to say is grow up. 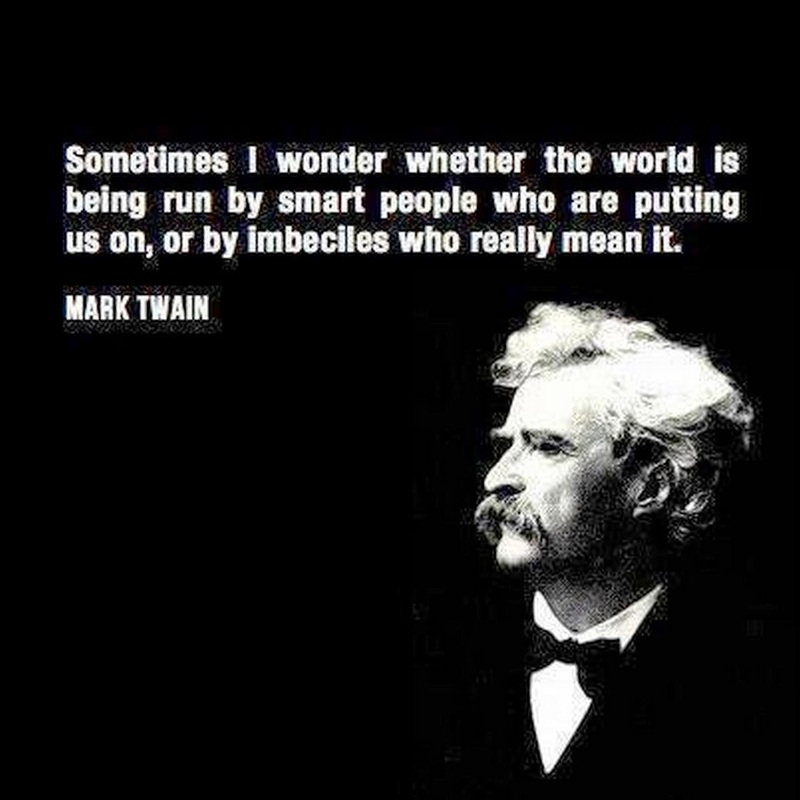 This kind of thinking is based on a flawed understanding of how the world really works. 1. SANCTITY OF CONTRACTS? : Union contracts regularly get busted or renegotiated during periods of stress. Just ask Detroit's auto workers, airline pilots, etc. 2. THE FINE PRINT: Private corporations, especially credit card companies, regularly play "fine print" games with their contracts, jacking up rates for no other reason than they can. 3. DISTRESSED DEBT OFTEN RENEGOTIATED: Bankruptcy judges in the U.S. regularly write down mortgages for commercial property, and other secured loans (just ask Donald Trump). 4. CONTRACTS-AGREEMENTS REGULARLY IGNORED: Many states - like California - backed out of contractually agreed upon raises after the 2008 market collapse. California even docked state employees 10 percent of their contracted wages to deal with the impact of the 2008 market collapse. 5. HIDING BEHIND BANKRUPTCY: Corporations and their subsidiaries regularly close up shop, file for bankruptcy, and ignore legal and other contractual obligations when they want to avoid legal obligations (like this one in West Virginia). There's more, but you get the point. In effect, market players who purchased distressed debt for pennies on the dollar knew - or should have known - what they were getting into. The sanctity of contracts is not carved in stone. The Vulture Funds at the center of this dispute are lucky Argentina is in the position they are today. Simply, put, if things had gotten out of hand and others had not stepped up to the plate to renegotiate, the Vulture Funds wouldn't have a pot to piss in today. Here's my take on the issue. First, the market players who are holding out for full payout knew they were taking a big risk when they purchased Argentina's distressed debt. They knew that Argentina was in the process of renegotiating it's debt. They knew that dealing with a country is different than dealing with individual creditors in a domestic market. 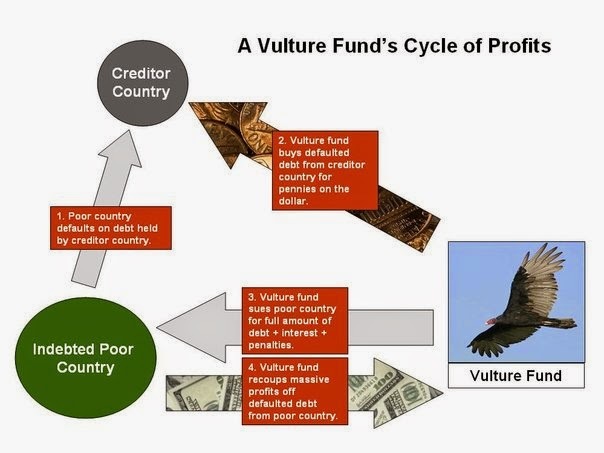 What the Vulture Funds are doing today, as they deploy the U.S. court system to do their dirty work, is simply mooching off of the blood and sacrifices of Argentina and the financial players who stepped up to the plate to renegotiate and help Argentina avoid political turmoil. Second, what Argentina did when it renegotiated its debt was effectively go through a bankruptcy escorted debt restructuring. The difference is that it was done at the level of the nation-state. As a result of debt restructuring Argentina was able to put in place a new debt management strategy, which has benefited all of Argentina's debt holders over the past 10 years. Using the courts to vacate the renegotiated contracts, and to get to the head of the payment line, is just wrong. What the Vulture Funds are doing today makes it clear that there are a group of market players (they're not investors) who don't care for the rules or the sanctity of the market. Worse, they believe the institutions of the state are here to guarantee their market bets. Think about it. 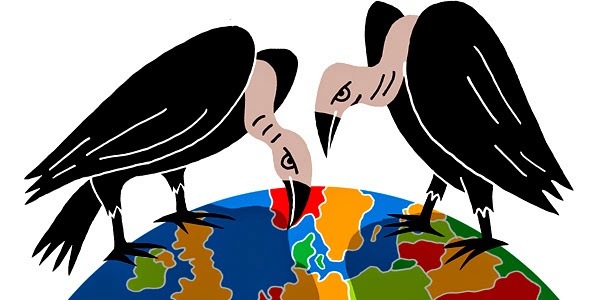 As the Vulture Capitalists balk at paying U.S. taxes they regularly use U.S. government courts, to try and manipulate a U.S. government structured international trading regime, to get a sovereign government to pay them in government backed currencies. Vulture Capitalists are simply acting as corporate free riders. 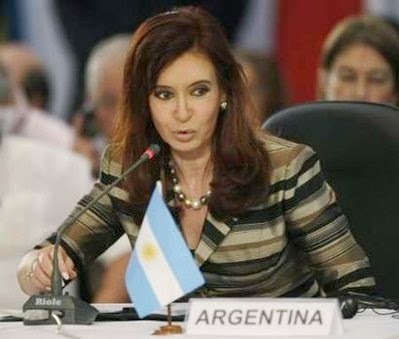 Finally, as Argentina's President Cristina Fernandez de Kirchner never tires of pointing out, Argentina has never repudiated its debt. It simply renegotiated debt terms, as market players often do. If the Vulture Funds win the day this will send a terrible message to creditors and sovereign nations alike. No sensible creditor will want to renegotiate if they believe that their renegotiated flow of payments can be disrupted by Vulture Capitalists, who get to jump to the front of the line after someone else has done all the hard work of making a nation whole again. 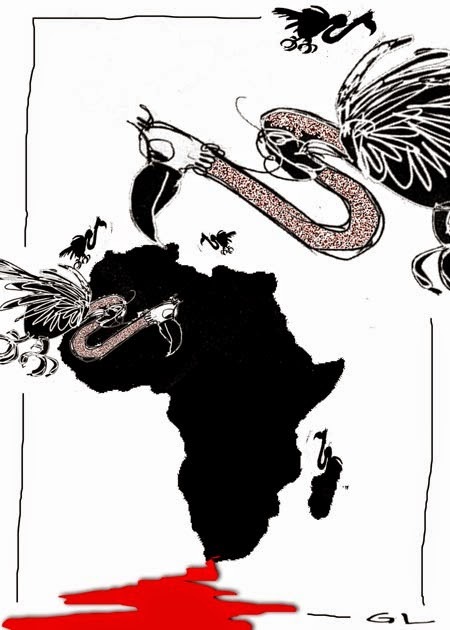 At the end of the day, when it comes to Argentina, the Vulture Capitalists are little more than wealth extractors rather than wealth creators. They would rather feast alone on an economic carcass than dine with their peers at an economic buffet. Argentina needs to take a hard line when their deadline to pay the Vulture Capitalists arrives this Thursday. 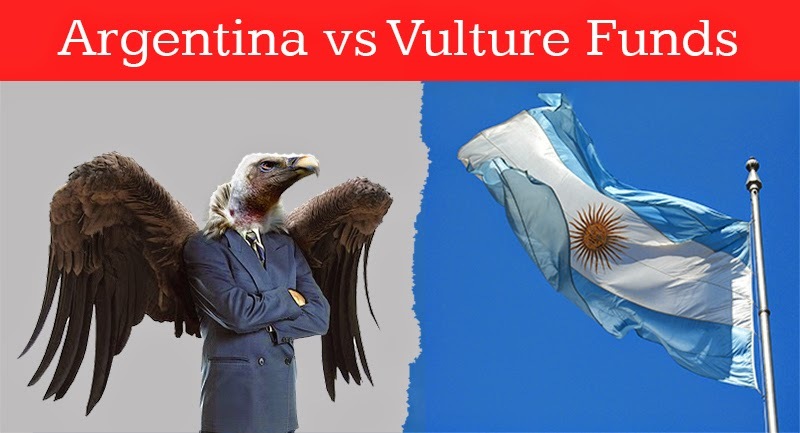 UPDATE (Aug. 1, 2014): It appears that Argentina has chosen to default on what it owes the Vulture Funds, and that's a good thing. Click here for information on billionaire Paul Singer, of the hedge fund Elliot Management, who has helped push Argentina into default. According to Vice News, after paying about $48.7 million for distressed debt Singer's firm is demanding that $832 million be paid (a return of 1,608 percent), with the rest of the Vulture Funds demanding a total of $1.3 billion. The NY Times' DealB%k has additional history and commentary here or here. UPDATE II (August 9, 2014): Getting personal? Judge Griesa is not happy with Argentina's response to this orders. He's threatening Argentina with contempt of court over statements Argentina has made about their debt and his claim that they defaulted on that that. Check it out here in the NY Times. UPDATE III (April 1, 2015): The plot thickens ... Argentina ousts local Citibank CEO for complying with U.S. court order, while ignoring Argentina's local laws regarding the restructuring of debt. UPDATE V (March 11, 2016): Argentina's new right-wing president, Mauricio Macri, agrees to pay $4.65 billion to four hedge funds, or about 75 percent what they were demanding. Vulture fund speculator Paul Singer nets about $2.4 billion, or 10-15 times his original investment. You can watch a YouTube video report of the deal here (893). Federal complaint filed against small Texas city's new ban on housing border kids and, of course, Muslims (Center for Public Integrity). A silly clip that I'm betting you will watch more than once (YouTube). Man gets run over by his own truck after road rage episode that he started (Gawker). Target has stopped asking job applicants if they've been convicted of a crime ... here's why (Nation Of Change). Poll finds that 64% of Americans believe Wall Street hurts them, and that the market is rigged against them (LA Times). The U.S. has passed Saudi Arabia as the world's largest oil producer (Nation of Change). The government rulebook for secretly labeling you a terrorist goes far beyond bombings, assassinations, and hijackings to include damaging computers used by financial institutions and acts intended to influence government policy through intimidation, among others (First Look). Then check this out. European Court rules that Poland violated terrorist suspects' human rights by allowing their transfer to a secret Polish detention center (a "black site") run by the CIA (NY Times). Families sick from fracking turn to scientists (Center for Public Integrity). What do Chinese dumplings have to do with Global Warming? A lot when you consider the larger modernization of China picture (NY Times). How oil and gas gained influence and transformed North Dakota (Center for Public Integrity). Mark Cuban threatens to dump corporations that move off shore to avoid paying U.S. taxes (Huffington Post). President Obama is going after the loophole that sends corporations to cheap tax haven countries (Business Insider). Commentary: Astoundingly legal tax thievery by America's corporate elite (Nation of Change). Detroit, other cash strapped cities, states slashing pension benefits while subsidizing professional sports stadiums (International Business Times). The end game behind shutting off residential water in Detroit is a likely privatization attempt (Buzz Flash). Thirsting for democracy in Detroit: Activists resist water service shutoffs, Wall Street, and privatization (Truth Out). People kept complaining that this restaurant sucked ... look what they found out (The Meta Picture). Ukraine under siege by the religious right (Buzz Flash). The militarization of small city police departments continues ... Newington, CT (pop. 30,000) was just awarded an $733,000 armored vehicle from the U.S. military (The Courant). It's mindless Modernization Theory all over again ... after spending millions of U.S. tax dollars on promoting soy-based products Afghans still don't like the stuff (Center for Public Integrity). After the assassination of Austria's Archduke Franz Ferdinand on June 28, 1914 in Sarajevo Austria-Hungary declared war against Serbia on this day 100 years ago. Because of German commitments made to the Autstro-Hungarian Empire they would be dragged into war too. 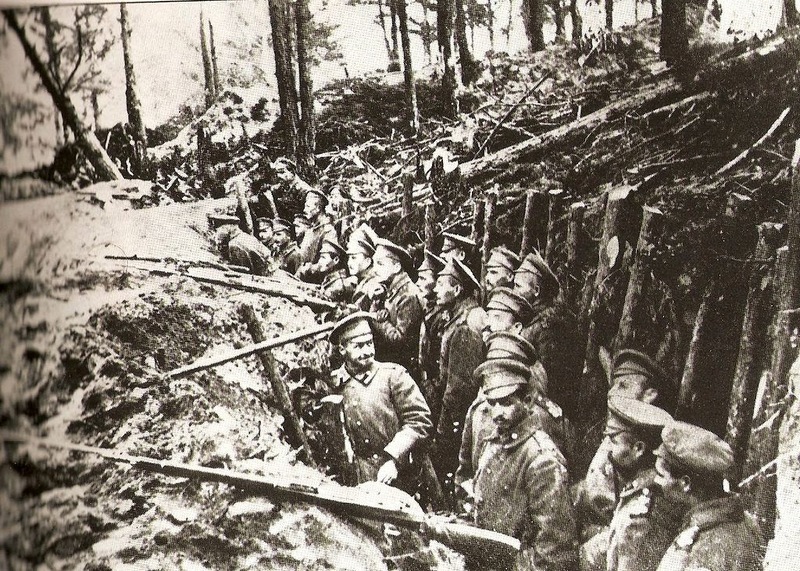 This triggered commitments from France, England, and Russia which would drag them in to defend Serbia. The Ottoman Empire (effectively Turkey) and the Bulgarians would join Germany and Austria-Hungary to form the Quadruple Alliance. the Ottoman Empire's Sultan Mehmed V, and Bulgaria's Tsar Ferdinand. 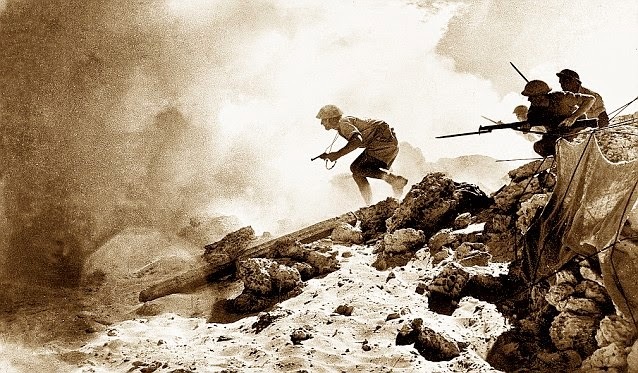 The United States, as we know, would join the war effort years after (April 6, 1917) "the war to end all wars" began, which would propel the U.S. to the top of the geo-political world. 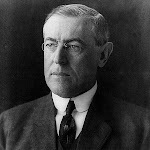 However, after dropping the ball on the Treaty of Versailles, the U.S. bungled the post-war world order as successive U.S. presidents ignored the world's need to establish a new world order after the collapse of colonial empires. 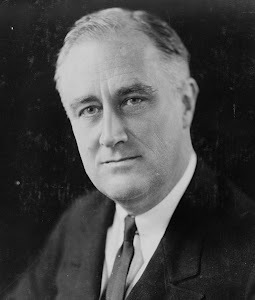 The United States would not make the same mistake after World War II. The U.S. assumed the mantle of leadership and created a world order that reflected a new understanding of power and order building. 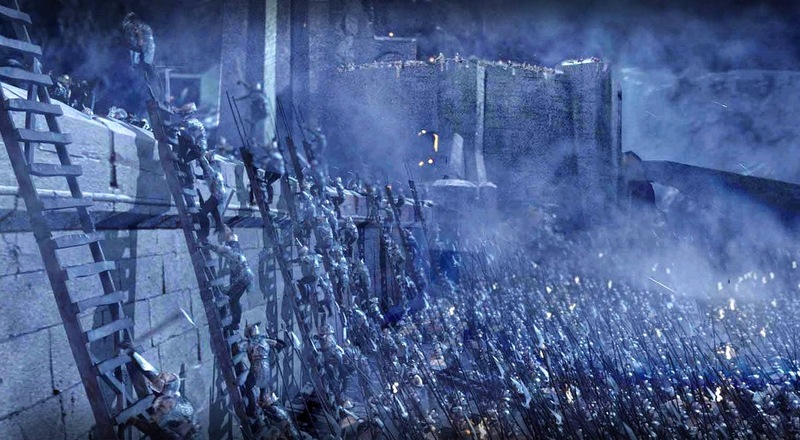 STORMING CORPORATE WALLS AT MARKET BASKET? Every once in a while something happens that exposes the underpinnings of American capitalism. In Lowell, Massachusetts, the birthplace of the Industrial Revolution, employees of the regional grocery chain "Market Basket" (with 71 stores in Massachusetts, New York, and Maine) have joined with managers and customers to protest the recent firing of Market Basket's CEO by its board of directors. Apparently he'd been too nice to his employees. He paid them well gave them good benefits. When the financial crisis hit in 2008, he replaced the money they lost from their retirement funds. Although his policy has paid off over the long term -- "Market Basket" is known for offering low prices and high levels of customer service, thanks in part to its worker-friendly policies -- the board wants more money, faster. This week, after eight managers who helped organize the protests were fired, an estimated 5,000 employees and customers rallied against the board of directors. Boycotts are being organized. Deliveries can't get through. Local politicians have weighed in with statements of support. This isn't the age-old labor versus management conflict. It's labor, management, customers, community and fired CEO versus greedy directors. Currently there are 5 states working to make their kids as scientifically illiterate as possible by teaching Creationism. 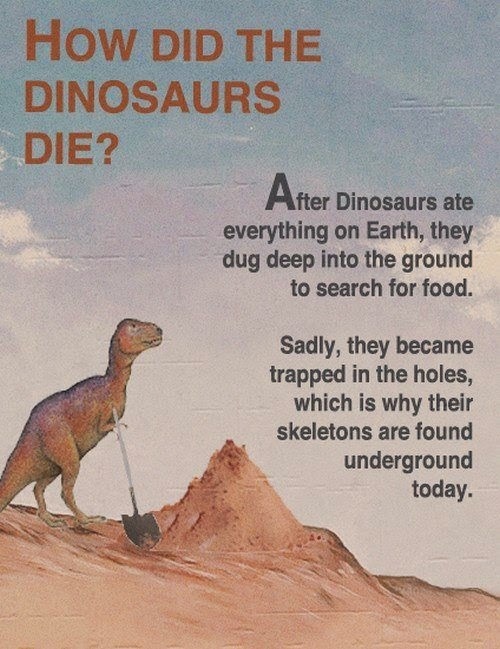 In the FYI category, Creationism attempts to explain the world from a biblical perspective, and it's not pretty. Among those who believe in Creationism is Ken Ham, who you can watch in in this incredibly disturbing clip. 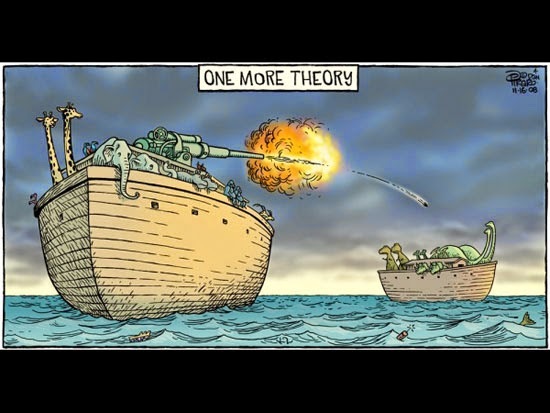 According to Ken Ham, most of the dinosaurs died in The Great Flood about 6,000 years ago because they didn't make it on to Noah's Ark. 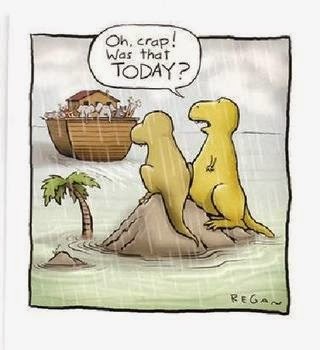 The dinosaurs - who were vegetarians, mind you - were left to drown, while those who did make it on to Noah's Ark eventually became extinct. 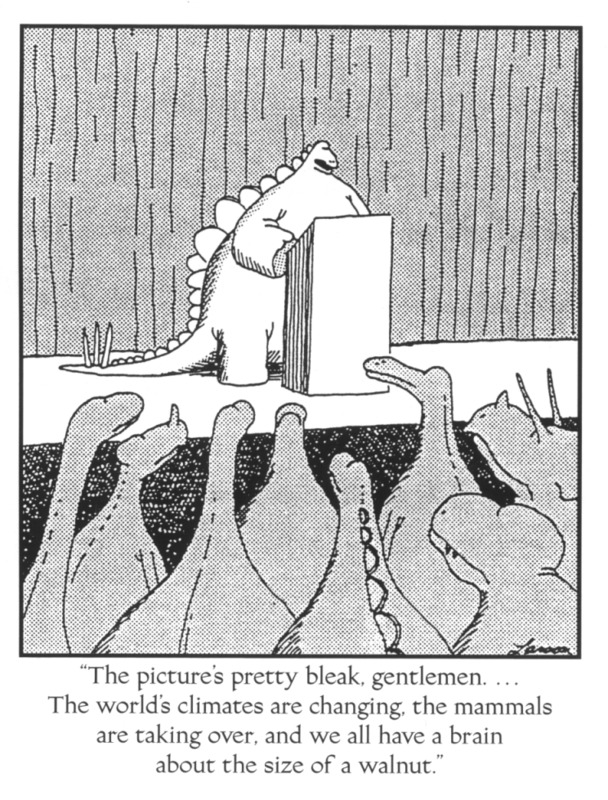 Ironically, Ham suggests the dinosaurs who did make it on to the Ark are no longer around because they couldn't adapt to the post-flood environment (does this make Ham an evolutionary creationist?). Seriously, with so many people buying into Ham's version of life it's no wonder the U.S. is falling behind the rest of the world when it comes to science and math. 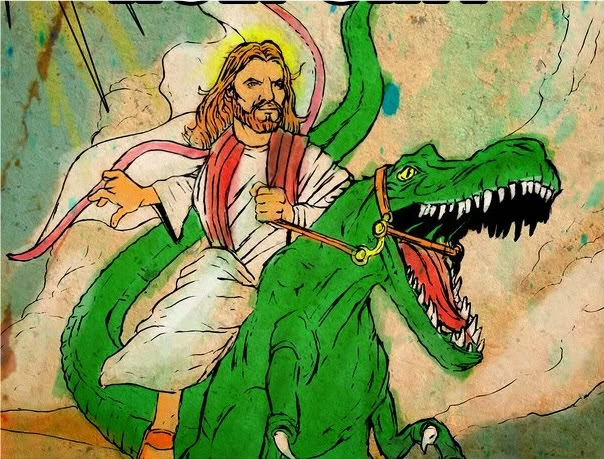 We now have entire segments of our population willing to reject critical thinking and the scientific method, choosing instead to place their faith in fairy tales and charlatans like Ken Ham. It could have happened, right? The security checkpoints through which passengers, including Atta and his colleagues, gained access to the American 11 gate were operated by Globe Security under a contract with American Airlines. United Airlines said on Monday it plans to outsource more than 630 union jobs [which include gate agents] at 12 U.S. airports in a cost-saving move. United Airlines reports it’s outsourcing 630 gate agent jobs at 12 airports to companies paying near-poverty level wages. Employees who have been with the company for years, earning middle-class wages of $50,000 a year, will be replaced by people paid between $9.50 and $12 per hour. United says it must do this to cut costs and raise its profits relative to other airlines. 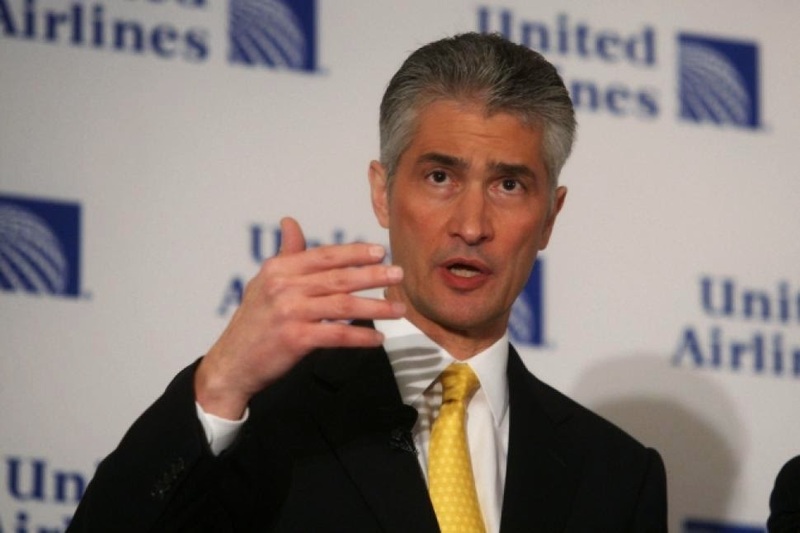 But United CEO Jeff Smisek gave himself $8.1 million this year. If he cut his salary just $2 million (in line with the CEO of the more successful Southwest Airlines, who gets $4 million), United would save about as much as it will by cutting the pay of those 630 employees. The problem in America isn’t that typical workers are paid more than they’re “worth” in the market. It’s that they have no bargaining power, while too many CEOs and other top executives have the power to pay themselves almost whatever they want. How do redress this power imbalance? Some call for stronger unions and greater shareholder say over CEO pay, but I'm increasingly of the view we have to change the organization of the corporation so that it has to respond to all stakeholders -- not just its shareholders but also its workers and affected communities. What's your view? So, yeah, this issue is not just about "saving" money to make United more competitive. At the end of the day, we all know that you get what you pay for ... and the race to the bottom continues. It's official. The Republicans are acting like a bunch of clowns (again). 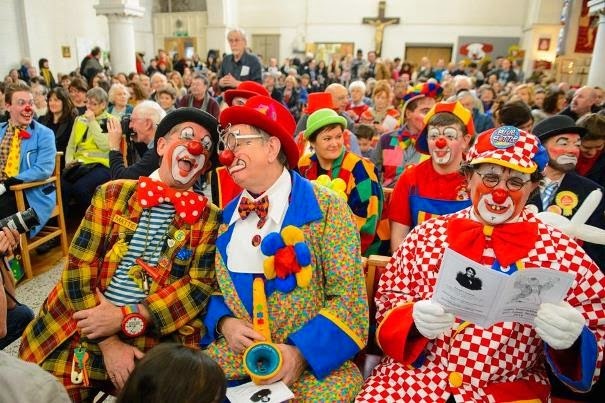 Clown conference ... or GOP Obamacare caucus? A GOP-led committee in the House of Representatives voted 7-4 along party lines today to advance John Boehner's frivolous lawsuit against President Obama. The lawsuit argues that President Obama has not properly implemented Obamacare. In the process the GOP voted down every amendment proposed by the Democrats that would let the American people know how much the lawsuit was going to cost taxpayers. As well, instead of passing legislation that would fix the language that's causing the confusion over the implementation of Obamacare, the GOP has made it clear that they're going home in August (watch Jon Stewart skewer the GOP for not fixing the language they're so upset about here). 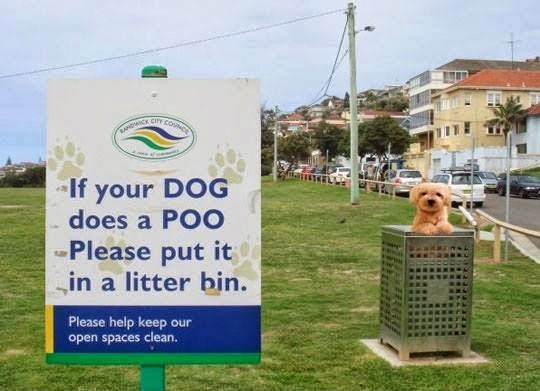 Let's repeat the point. The GOP is claiming that there are flaws in the language of Obamacare. But they're not going to do anything to fix a law they did nothing to advance, but are now claiming they want to be properly implemented. In spite of being the least productive Congress in recent history Speaker John Boehner and his "Do Nothing" Republican colleagues in the House of Representatives want to impeach and sue President Obama. They claim he has abused his authority and become a dictator, as he issues one executive order after another. In their eyes, he's become Obama the Hun ... a tyrant of the highest order. Here's the problem with the GOP's "Obama-the-Tyrant" claim. President Obama is on pace to issue fewer executive orders than any president since Benjamin Harrison (and maybe even Grover Cleveland). To date, President Obama has issued 182 executive orders, which is far below the pace set by Presidents George W. Bush (291), Bill Clinton (364), and Ronald Reagan (381). Here's another problem with the Far Rights "Obama-the-Tyrant" claim. The people yelling the loudest wouldn't have a voice to make any of their crazy talk claims if President Obama were a real tyrant. Microsoft lays off thousands with seriously bad memo (New York Magazine). 3-year-old spends almost every day with his 89-year-old WWII veteran best friend (Huffington Post). 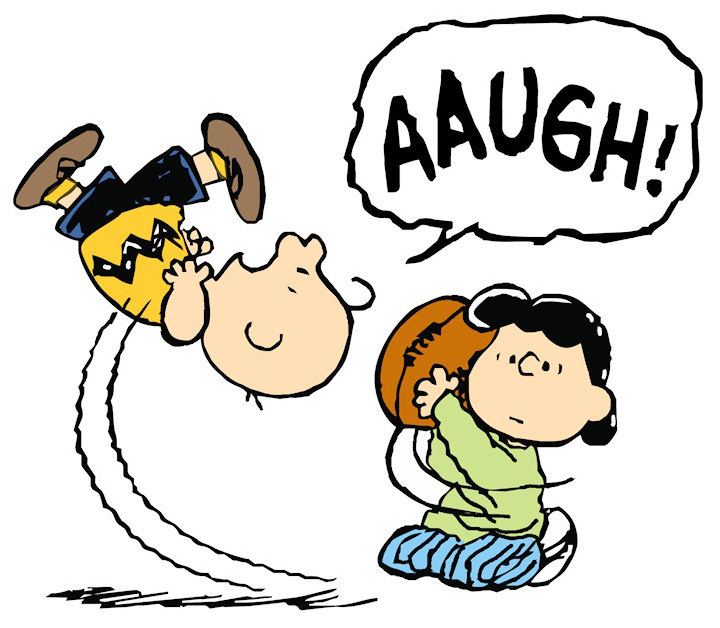 The world is finally catching on to the Fed's failures (Zero Hedge)? Child migrants have been coming to America alone since Ellis Island (Nation of Change). 'The Ideal Head': Bizarre racial teachings from a 1906 textbook (The Atlantic). The 50 greatest Saturday Night Live sketches of all time (Rolling Stone). 10 disturbing facts about one of Latin America's cruelest dictators (Listverse). 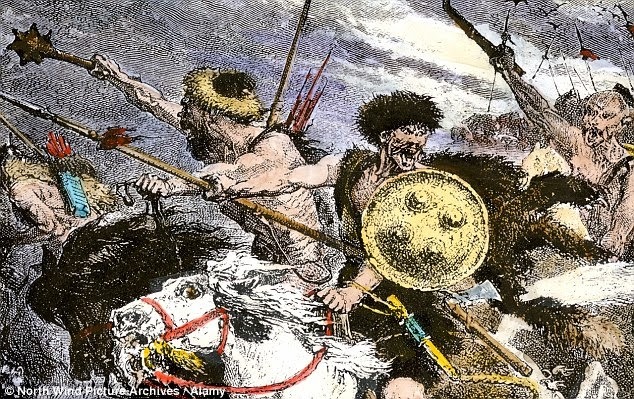 10 tales of how countries got their names (Listverse). Five states gunning to make their kids as scientifically illiterate as possible by teaching creationism (Truth Out). U.S. empire reaches breaking point, time to end it (Nation of Change)? And exceptional decline for an exceptional country (Nation of Change). Creationist Ken Ham says we should end the space program because aliens are going to hell anyways (The Raw Story). Confused TSA agent rejects District of Columbia ID, demands to see U.S. passport (Huffington Post). Right-wing youth leader threatens his 'gay' dog on Facebook: 'Don't challenge my principles' (The Raw Story). Idiot congressional staffer brings gun to Congress (Nation of Change). Greenpeace loses millions after idiot 'senior' employee bets (it's not investing) on currency markets ... gets fired too (Nation of Change). The rise of the non-working rich (Robert Reich). The limits of corporate citizenship: Why Walgreen shouldn't be allowed to influence U.S. politics if it becomes Swiss (Robert Reich). 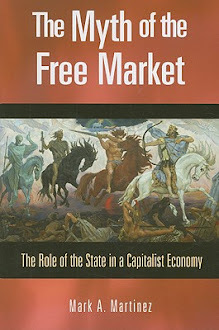 Freedom, power, and the conservative mind (Robert Reich). CO2 emissions have reached historic levels as temperatures and sea levels continue to climb (Daily Mail). Goodbye, Miami ... But long before the city is completely under water, chaos will begin (Rolling Stone). Global warmings terrible new math: Three simple numbers that add up to catastrophe - and make clear who the real enemy is (Rolling Stone). Pacific drones discover islands of garbage made out of tsunami debris (Daily Mail). Floating plastic-garbage islands in our oceans (Buzz Flash). On this day in history (July 22, 1862) President Lincoln told his cabinet about his Emancipation Procomation plans (History). New Age leader sues ex-students over leaked video of her drunken racist anti-gay rant (The Raw Story). The economic lynching of America ... Since the recession began trillions of dollars in wealth has been created, with almost all of it going to the richest white 10% (Nation of Change). The 7 worst NFL coaches ever (Wall Street Cheat Sheet). Dictatorshp's shadow rears its ugly head in Brazil's World Cup (Truth Out). 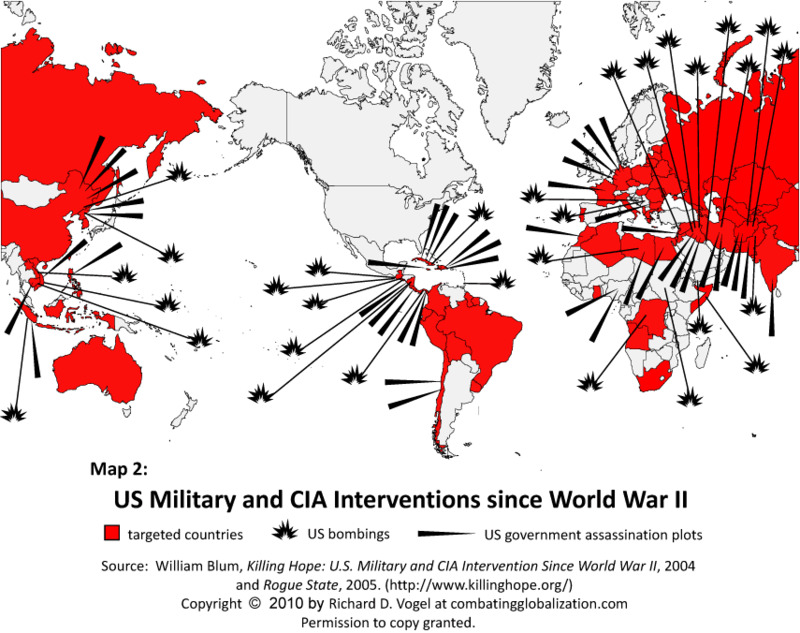 Following up on my previous blowback post, this William Blum map shows us which countries were either targeted by the U.S., bombed, or experienced CIA sponsored interventions since the end of World War II. As we fight for "freedom" in far the reaching corners of the world it's clear that most Americans have no real idea why other countries "hate us." Similarly, most Americans have no clue why we are dealing with child refugees from Central America today. Let's not kid ourselves. What's happening on the border is not a "sudden" problem, and has little to do with President Obama or his immigration policies. What's happening is that our foreign policy chickens are coming home to roost. The reasons why are many, and tied to historical developments the U.S. press won't address, and most Americans don't care to learn about. What's left out of the U.S. border-child refugee discussion is just as important as what the media's Talking Heads are telling us. We know that Central American families believe that even though the journey to the United States is a dangerous one they are willing to send their children on the trip because of the hope that they will make it and find a better life. This is considered a better option than the life prospects their children face at home. The prospect of being drawn into gangs, terrorized, or murdered has become an everyday reality for the Central American kids now arriving at the U.S. border. What we're not told is how this reality can be attributed to American foreign policy in the region during and after the cold war. It's what political scientists and policy insiders call blowback. From South East Asia to central Africa and the Middle East the United States responded to a series of foreign policy challenges in a way that created challenges today that may be worse than the original problem - long after the cold war ended. Here's what Central America is dealing with after generations of being the cold war playground of the superpowers. Ever since 1954, when the CIA led a coup against Guatemala's democratically elected President Jacobo Arbenz, the U.S. supported one military dictatorship after another in Guatemala. Similar policy lines were followed in El Salvador, Honduras, and Nicaragua. The goal was to rid the region of communists and pesky nationalists while supporting U.S. commercial interests in the region. 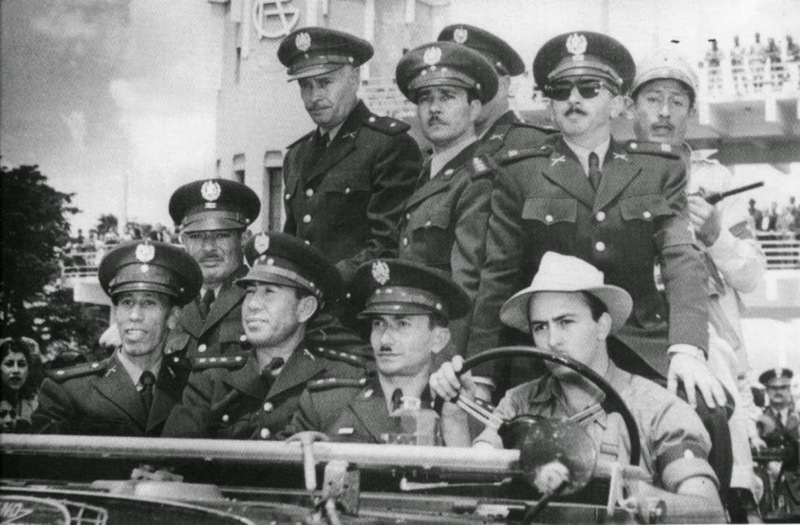 After the CIA overthrew Guatemala's democratically elected President Jacobo Arbenz in 1954 the United States installed military officer Carlos Castillo Armas as president. Castillo Armas became the first in a series of U.S. puppet presidents, and was assassinated in 1957. The driver here, seated next to Castillo Armas during his "triumphant" entrance into Guatemala City, was a CIA operative. The end result was the establishment of militarized authoritarian regimes that ignored the needs of the regions poor, and their subsistence farmers. Worse, they terrorized local groups as they began to rise up and fight for their rights, labeling every movement and progressive group as communists. The impact was predictable. It was during this time that people from Central America's most terrorized states began to migrate to the United States. The root cause of [the U.S. border] crisis is not U.S. immigration law or the policies of one U.S. president. The root cause is the violence and poverty that make these children’s lives at home intolerable. The root cause dates to the parents and grandparents of the young people fleeing their countries today ... two superpowers — the United States and the Soviet Union — chose our region as a place to work out their disputes. They were eager to help Central America transform students into soldiers. They were eager to provide the weapons while we provided the dead. One unfortunate development is that while the U.S. supported corrupt military dictatorships in Central America - by providing money, military training, weapons, and the excuses that allowed the region's militarized regimes to brutalize their populations - little to nothing has been to "de-militarize" or transition each society after the cold war. This is why the case of Nicaragua is so instructive. Nicaragua was effectively run as a private state by the Somoza family for well over 40 years. 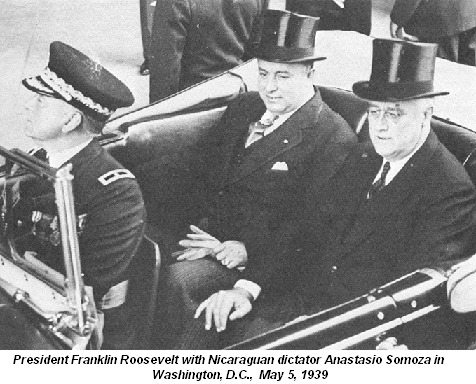 After the patriarch Anastasio Somoza came to power in the 1930s the Somozas used their U.S.-trained National Guard to terrorize both non-supporters and Nicaragua's rural poor alike. Among those who would meet their death at the hands of the Somozas in 1934 was the nationalist guerrilla leader Augusto Cesar Sandino. Dictator Anastasio Somoza was assassinated in 1956, which paved the way for his two kids - Anastasio, Jr. and Luis - to come to power. It was at this time that the looting of the Nicaraguan economy by the Somoza family hit new heights. 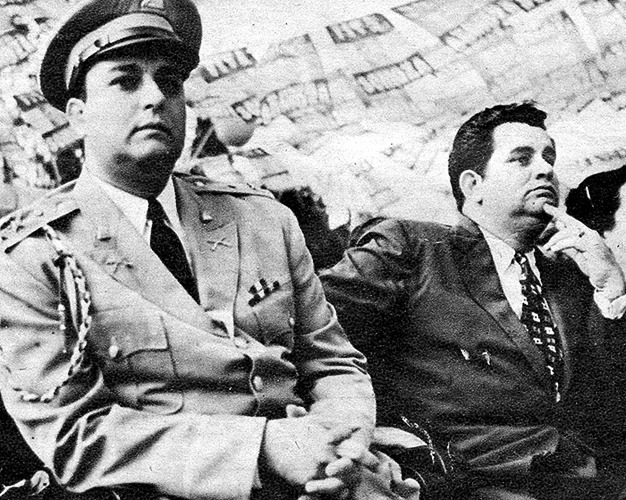 The Somoza children, Anastasio Somoza (Left, 1925-1980) and Luis Somoza (Right, 1922-1967), ruled Nicaragua after their father was assassinated in 1956. After the oldest brother, Luis, died of an early heart attack in 1967 Anastasio assumed the mantle of leadership. The youngest brother, who was much more corrupt and brutal, was eventually forced out in 1979 when the Sandinistas - who originally led a broad coalition of progressives and moderate industrialists - came to power. At the time of Anastasios ouster, it's estimated that the Somozas and their inner family circle owned or ran about 50% of the Nicaraguan economy. The Sandinistas oust Anastasio Somoza in 1979. 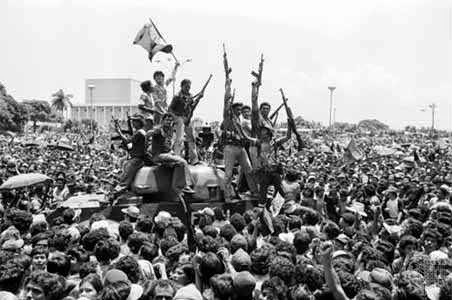 After expelling the Somozas and their dreaded National Guard the Sandinista also ridded Nicaragua of the Somoza's militarized police force, which did little beyond assist the National Guard in terrorizing the Nicaraguan people. In an effort to change the security and police culture of Nicaragua the Sandinistas installed a citizens militia to help police Nicaragua. In spite of the fact that many wealthy Somoza supporters fled Nicaragua for Miami and other safe havens few Nicaraguans left after the revolution. With no National Guard to fear Nicaraguans embarked on a development path that was distinct from its neighbors. A reading campaign reduced illiteracy from 50% to about 12%, while national programs in health care, education, and land reform (among others) received international recognition. All of this has helped to reduce crime and violence in Nicaragua. Today Honduras, El Salvador, and Guatemala are ranked among the top 5 countries with the highest murder rates in the world. 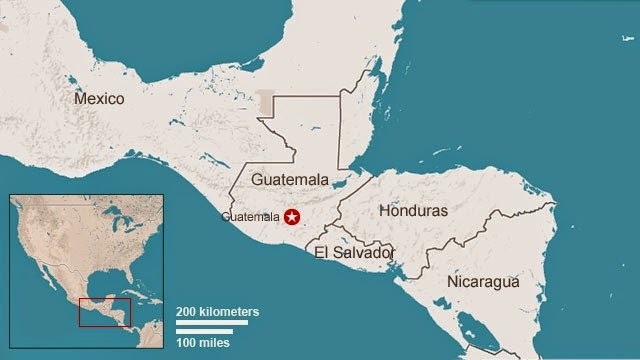 Specifically, Guatemala is ranked #5, with 39.9 murders per 100,000 people. 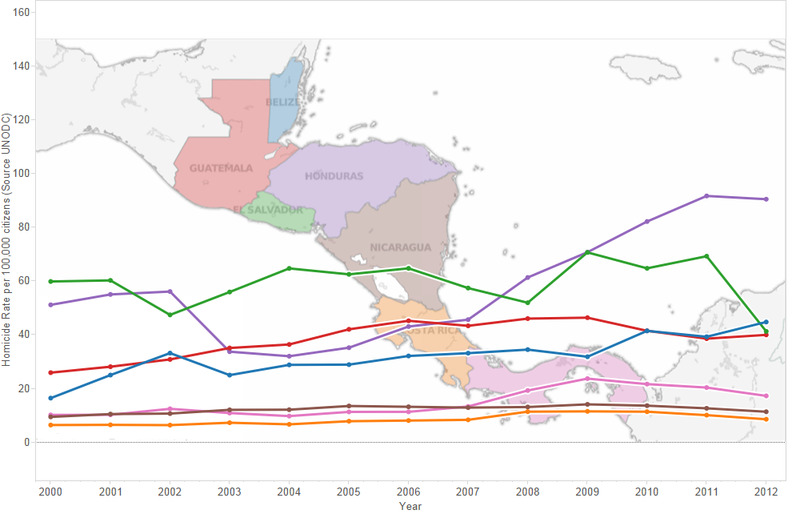 El Salvador is #4 with 41.2 murders per 100,000 people. Honduras is #1, with 90.4 murders per 100,000. By contrast, Nicaragua's homicide rate is about 11 per 100,000. This is about the same rate as Costa Rica's (which is often referred to as the Switzerland of Latin America). According to the UN's Office on Drugs and Crime Guatemala, Honduras, and El Salvador are ranked among the top 5 homicide states in the world. The reasons for this homicide gap can be traced to distinct development patterns, both before and after the cold war. Children from Guatemala, El Salvador, and Honduras are living a bleak existence caused by years of military dictatorships, propped up by the U.S. 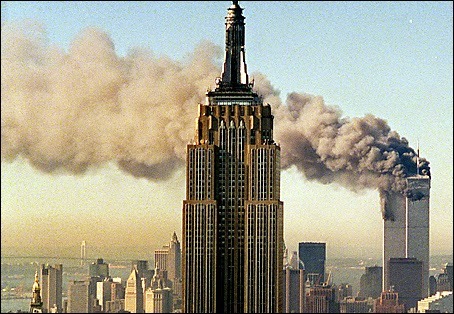 When the cold war ended the billions of dollars dedicated to weapons and training were not turned into aid for rebuilding or educating the people (If we're looking for parallels, think about putting an addict through a 12 step program without the steps, or the program). Conversely, when the Somoza's were removed and the National Guard fled, Nicaragua took another path that did not include U.S. military advisers or weapon support. The Nicaraguan people did not need to escape north like those who lived through the instability caused by the regions corrupt military dictatorships during the 1980s. To be sure, Nicaragua is still marked by inequality and few opportunities (in part because the U.S. did what it could to sabotage the Sandinista economy). The big difference is that Nicaragua took another path, and now lacks the violence and the military ties to the United States that it once had. Unfortunately, Guatemala, Honduras, and El Salvador can't say the same. UPDATE (8-6-14): After editing this blogpost (cutting out one-half) I submitted it to our local paper, the Bakersfield Californian, which you can access here. GUEST POST: "AMBASSADOR STEVENS' ACTIONS IN BENGHAZI, NOT ONLY CARELESS BUT RECKLESS"
Guest Post from Ray Gonzales, Ph.D.
Dr. Gonzales is retired from the California State University system, served in the United States Marine Corps (1957-59), was elected to the California State Assembly from Kern County in 1972, served in the first Jerry Brown administration, was a diplomat in the U.S. Foreign Service from 1980 to 1990, and Director of Recruitment for the Peace Corps from 1993 to 1997. John Gordon Mein was the first American Ambassador to be assassinated while serving in office. 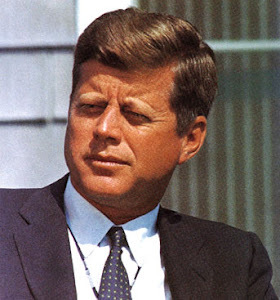 He was killed in Guatemala City on August 28, 1968. Since then, there have been six more U.S. ambassadors killed while serving abroad with the latest being Ambassador Christopher Stevens, who was killed in Benghazi, Libya on September 11, 2012. Stevens’ death has caused continuing criticism of American diplomatic security abroad with one of the latest manifestation of partisan rancor taking place Jan. 23, during Secretary of State Hilary Clinton’s six hours of testimony before House and Senate Foreign Affairs Committees. Republican Senators and House Members of these respective committees continue to accuse the State Department, and Secretary Clinton in particular, of malfeasance, and in the words of Senator John McCain, “It was either willful ignorance or abysmal intelligence….” Republican critics of the events surrounding the Benghazi Consulate attack also accuse the Obama administration of an extensive cover-up of the entire affair. The truth is, that while the killing of Ambassador Stevens and three other U.S. employees was tragic and lamentable, Ambassador Stevens, himself, was, in many ways, responsible for his own tragic death. His actions were not only dangerously risky but one might say, even reckless. While obviously he can be considered a true American hero for giving his life for his country, and one does not want to impugn his character, we must, nevertheless, look at his behavior leading up to the tragic event. As noted above, John Gordan Mein’s assassination in Guatemala in 1968 was the first killing of a U.S. ambassador. As a result of this assassination, the U.S. Embassy in Guatemala has continuously had a very high level of security surrounding the ambassador and other embassy personnel. I served as a political officer at the Guatemalan Embassy from 1980 to 1982 during the years of rebellious turmoil in that country and all of Central America. 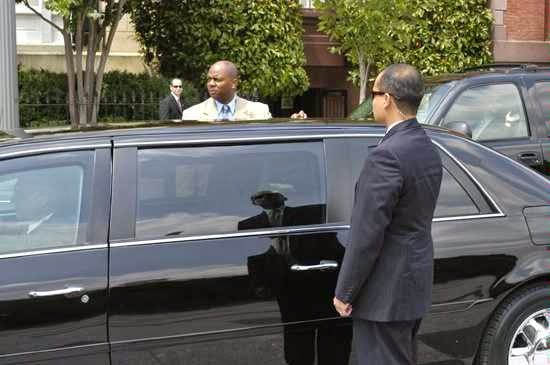 Our ambassador at the time, Fred Chapin, always traveled with three American agents in an armored limo with two additional chase cars, and a total of 14 security guards whenever he traveled outside of the embassy. One of the security agents in the limo was always a paramedic and the trunk of the limo contained, not only additional weaponry, but also had extensive medical supplies, including plasma and oxygen. 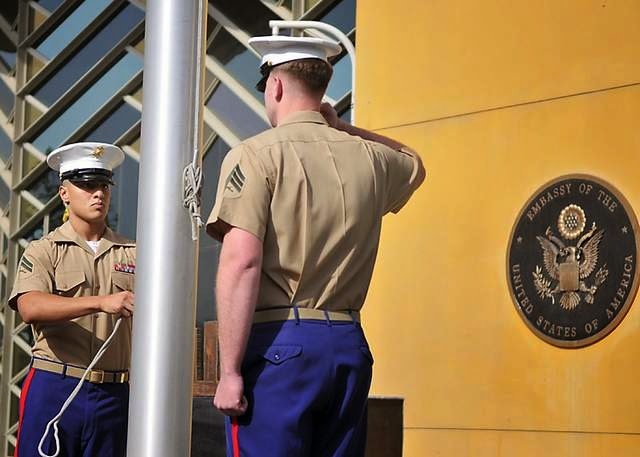 It should be noted that Marine security guards are assigned only to U.S. embassies abroad, and generally not to consulates. In most instances, this is only a detachment of two squads, 24 Marines, and in bigger embassies, perhaps a platoon of 36 Marines. 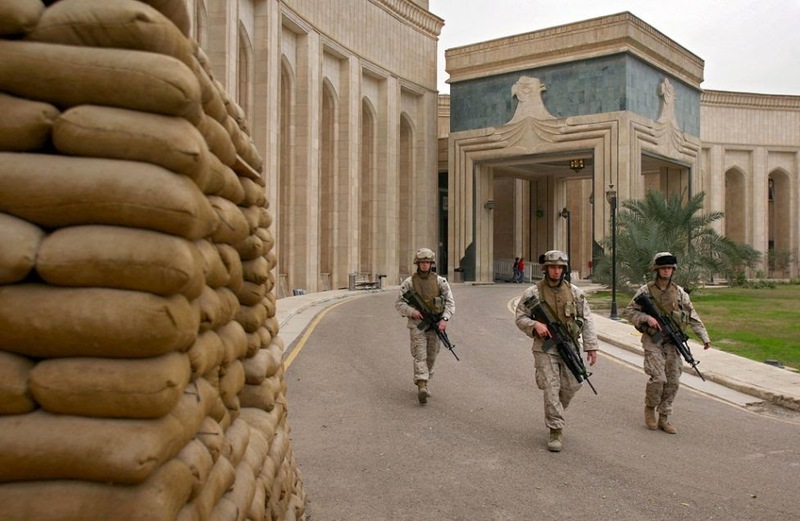 In the case of Libya, there were Marines assigned to the Embassy in Tripoli, but not to the consulate in Benghazi. 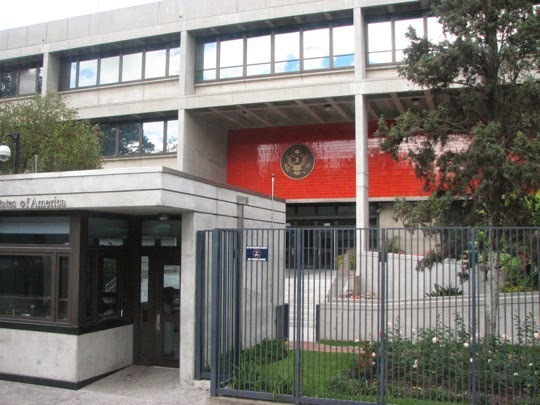 The consulate was protected by a handful of Libyan security personnel. Ambassador Stevens arrived at the consulate with only two American security agents, Glen Doherty and Tyrone Woods, who were also killed in the attack on September 11. The third U.S. Foreign Service officer killed along with the Ambassador was Sean Smith, a consulate information officer, not a security agent. Ambassador Stevens’ visit to the consulate in Benghazi at this particular time raises many questions as to the “dangerously risky” behavior on his part. There were only seven Americans in the compound at the time, including Ambassador Stevens, who was visiting Benghazi “to review plans to establish a new cultural center and modernize a hospital.” There were no Marines protecting the consulate and the Ambassador had only his two American security agents with him. Given the continuing turmoil in Libya after the fall of Moammar Gadhafi, it is difficult to understand why Ambassador Stevens would venture out of the Embassy in Tripoli with such little protection and visit the minimally guarded consulate in Benghazi. The idea of visiting the city for the purposes of “establishing a new cultural center” at a time of such turmoil in the country seems unreasonable. But this was not out of character for the Ambassador. 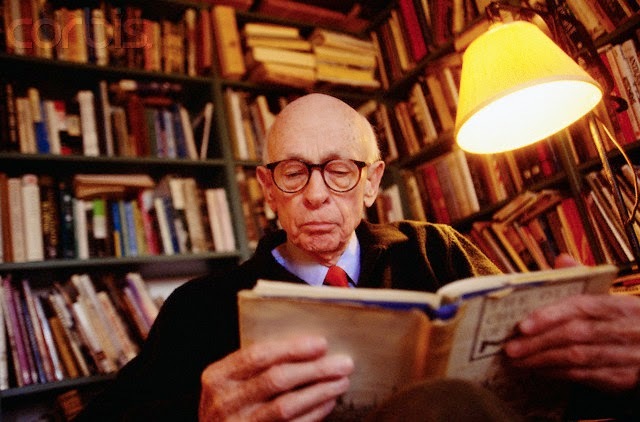 Stevens was fluent in Arabic and considered himself and expert on the Islamic culture. 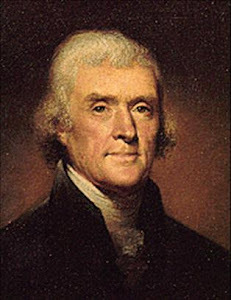 He had made numerous efforts to go out among the inhabitants of the country in an attempt to demonstrate how sensitive U.S. diplomats were to the struggles of the people in the midst of the civil turmoil. Certainly, Ambassador Stevens knew there were risks. Three days after the attack on the consulate, Arwa Damon, a CNN correspondent, found Ambassador Stevens' diary at the site of the attack. In the diary, Stevens had “expressed his concern about the growing al-Qaeda presence in the area and his worry about being on an al-Qaeda hit list.” This alone should have been reason enough for Ambassador Stevens to exercise more caution for his own safety and that of his security detail. For him to have left Tripoli for the consulate in Benghazi with only two security guards as protection was more than careless. 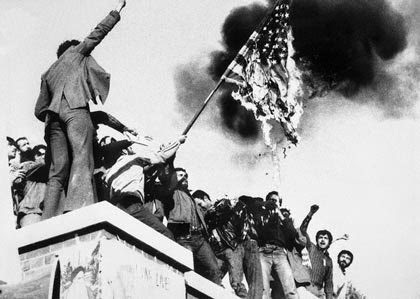 His behavior was more reflective of a “cultural attaché” than that of an ambassador of a Middle East country in the throes of revolution. While Justice Anderson further noted in his McClatchy comments, Stevens’ “optimism was almost tangible, but I don’t think it was Pollyanna or rose-tinted. He knew the risks.” Yes, he knew the risks but seems to have totally disregarded them. As previously noted I served in Central America during the turbulent 1980s. From 1980 to 1984, I was a frequent visitor to El Salvador, Nicaragua and Honduras, along with the two years I was permanently stationed in Guatemala. No ambassador in any of those countries would ever have considered traveling outside of the embassy with less than a dozen security personnel in fully armored vehicles. We are told there was a CIA security detachment not far from the consulate in Benghazi, but it was not on the scene protecting the consulate or the ambassador. Stevens’ actions were not in keeping with necessary security procedures required in the region. With Libya, Syria, Egypt and other countries of the Middle East experiencing continuous rebellion and death, one would assume that our diplomats would exercise better judgment. No one, not Secretary Clinton nor anyone else in the Administration, would ever want to blame Ambassador Stevens for his own death. Certainly murdering terrorists were responsible. He is, indeed a martyr in the history of American diplomacy. His genuine goodness, brave behavior, and concern for the Libyan people are without question. But the Department of State in its efforts to improve security for its diplomatic missions abroad, should also insist that its diplomats act intelligently and with the utmost caution. Ambassador Stevens’ actions, while noble, were not only careless, but naively reckless. Ambassador John Gordan Mein's assassination - like Ambassador Stevens' - did not occur in a vacuum. When Ambassador Gordan Mein was killed in 1968 Guatemala was in the midst of a vicious civil war that started with the political instability created by - to put it bluntly - the United States after it overthrew the democratically elected government of Jacabo Arbenz in 1954. After installing and backing a succession presidential-miliatry puppets to govern Guatemala the United States did little as one military dictator after another ignored and then terrorized Guatemala's rural poor. The U.S. turned a blind eye to the state sponsored violence because successive Guatemalan governments put a priority on maintaining a strong anti-communist stance (to curry U.S. favor) and protecting U.S. commercial interests. Responding to the brutality and inequality, nationalist rebel groups began to spring up throughout Guatemala to oppose the poverty, inequality, and military dictatorships. The guerilla group - FAR, or Fuerzas Armadas Rebeldes - that killed Ambassador Gordan Meins was one of many groups that rose up to protest Guatemala's U.S.-backed military dictatorship. Violence was so entrenched in Guatemala that when the Archbishop was kidnapped in 1968 no one seemed to care because "it was like athlete's foot in a leper colony," according to one observer. Put another way, Ambassador Gordan Mein's assassination was a product of a violent atmosphere that he may have known about but did not adequately prepare for ... in spite of his understanding of the region. I'll let you draw your own parallels, and conclusions with the Stevens case. Imagine you have a family that's grown accustomed to taking annual vacations. The problem is that for the past 10 years all of those vacations have been put on the credit card. You're now deeply in debt. You decide that you're no longer going on vacation unless you can find a way to pay for the trip, up front. Last week the Republican-led House of Representatives voted to spend another $287.4 billion dollars of your money without seeking new revenues to cover the "new" spending. This might be seen as business as usual in Washington except for one thing: Earlier this year the GOP signed off on legislation that said any new spending that increases budget deficits have to be offset with new sources of revenue. 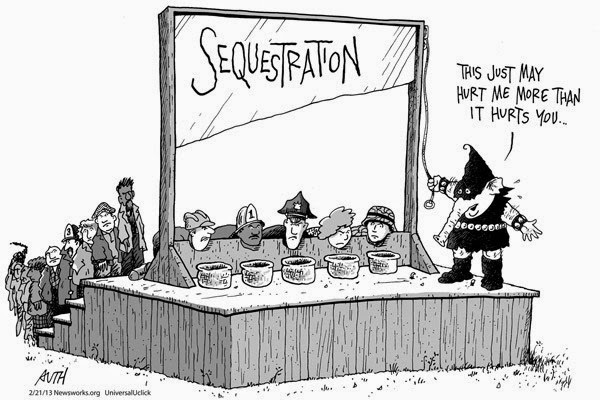 This trade-off was part of the sequestration deal that cut government spending across the board, and prohibited new spending unless new revenue sources could be found. At the time, cutting government spending to fix our budget deficits (and our national debt) was what drove the GOP to force a government shutdown. Fiscal responsibility, you know. Well, guess what? House Republicans have now decided they want to continue taking vacations while putting the cost on the government credit card (as it were). Specifically, the GOP passed legislation last week that allows corporations to write off the cost of new assets and equipment more quickly than before. So, for example, if a corporate farm decides that they want to purchase new tractors and crop dusters under the Republican plan they can deduct 50% of the expenditure from what they pay in taxes. This means that if a corporate farm spends $10 million for new capital assets and improvements the American taxpayer gets to pay half the tab. A few million here, another million there, and things begin to add up. What the Republicans did on Friday has a $287.4 billion price tag over the next 10 years. Shifting $28 billion each year from our bloated defense budgets, over the next 10 years, would have paid for this corporate subsidy. But the GOP wouldn't even consider it. Post by Chris Van Hollen. It should be noted that Rep. Von Hollen is no stranger to extending tax breaks for corporate America. He's even introduced them in the past. What he's concerned about today is that the GOP's current bait & switch policy allowed them to indiscriminately cut other government programs (under threat of a shutdown), but House Republicans now feel no sense of shame by refunding and extending corporate subsidies that they promised would also be cut back (click here to see Michigan's Rep. Sander M. Levin's comments on the GOP's bait & switch tactic). This helps explain why Americans are so frustrated with Washington, and why no one should take our current GOP-led House of Representatives seriously. ADDENDUM: As a point of reference, these kind of subsidies are euphemistically called "bonus depreciation" deductions, or tax expenditures. They're fancy ways of saying taxpayer funded subsidy, or corporate welfare, and cost the American taxpayer about $1.1 trillion per year. The "bonus depreciation-tax expenditure" language helps this kind of corporate welfare fly under the radar. And, yeah, eliminating the $1.1 trillion in tax expenditure write offs would go a long way in fixing our deficit-debt problems.